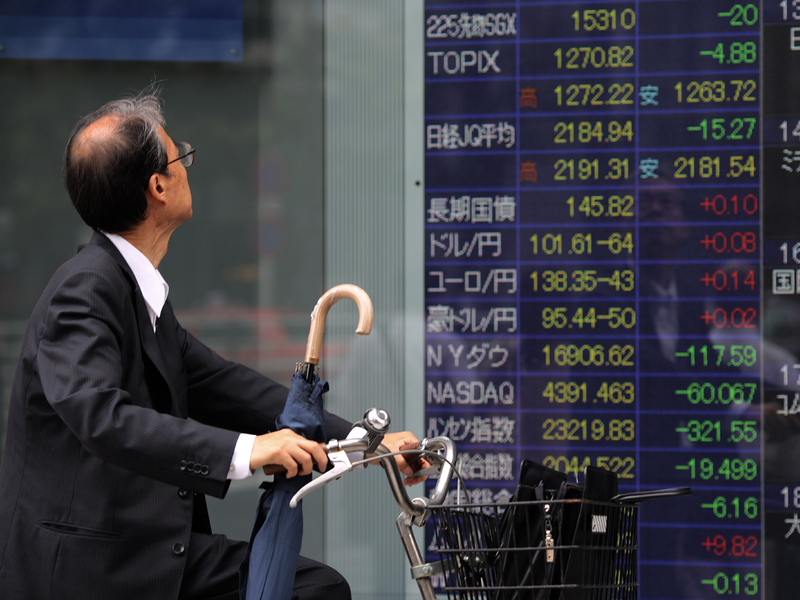 TOKYO - Asian stocks fell for a third day Wednesday and European markets traded tepidly as caution spread ahead of corporate earnings and after record highs on Wall Street. The just-started U.S. earnings season as well China's second quarter GDP figures, due next week, will help investors determine whether the recent run up in stock valuations has been justified. The Dow Jones industrial average last week topped 17,000 for the first time in its 118-year history. "Investors globally have become a bit more cautious," said IG strategist Ryan Huang in a market commentary. European markets were muted in early trading. The FTSE100 in Britain lost 0.3 percent to 6,717.02 while France's CAC-40 was little changed, edging up 0.1 percent to 4,345.37. Germany's DAX gained nearly 0.1 percent to 9,779.13. In Asia, Japan's Nikkei 225 recouped some of its losses from earlier in the day to close down 0.1 percent at 15,302.65. Hong Kong's Hang Seng shed 1.6 percent to 23,176.07. "Investors headed for the exits on negative overseas leads," said Michael McCarthy, chief market strategist at CMC Markets in Sydney. "In a glass half-empty trading environment, investors ignored higher iron ore prices, benign China inflation and a strong start to the US reporting season by Alcoa." The U.S. earnings season got started after the closing bell Tuesday when aluminum maker Alcoa reported results that were better than investors expected. Wells Fargo, the No. 1 home mortgage lender in the U.S., reports on Friday. The immediate attention of markets is likely to be on the release of minutes later Wednesday from the U.S. Federal Reserve's last policy meeting. CMC Markets said in a commentary that the minutes are likely to sound more "dovish" than current economic conditions warrant since the Fed's last meeting was before June's strong jobs numbers were released. In energy markets, benchmark U.S. crude for August delivery was down 5 cents at $103.35 a barrel at 0805 GMT in electronic trading on the New York Mercantile Exchange. The contract fell 13 cents to close at $103.40 on Tuesday. In currencies, the euro rose slightly to $1.3615 from $1.3612 late Tuesday. The dollar rose to 101.66 yen from 101.52 yen.